HowSoon: 1 Click. Next departure. Today, we published HowSoon, an android app on Google Play Store. 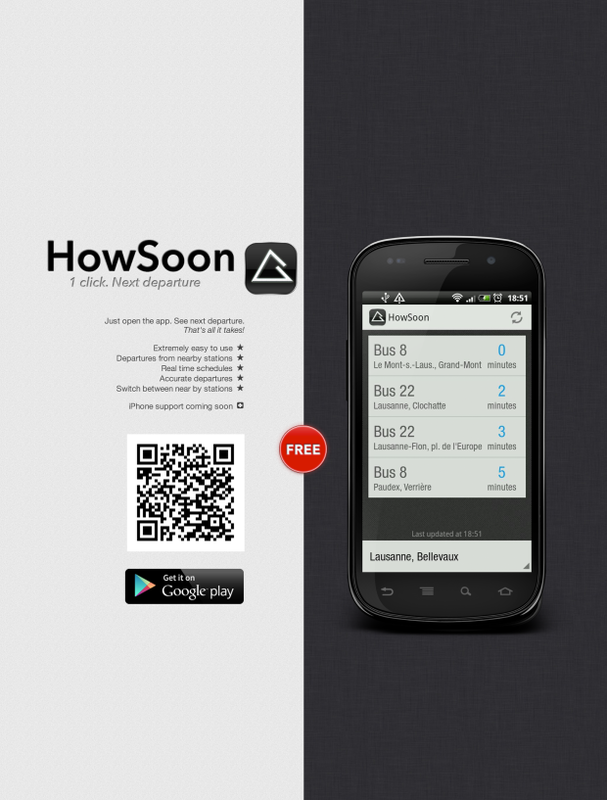 HowSoon is an easy to use, free app that helps you to quickly find the next departures for routes near you. No need to type in station codes, search for departures, look through deep lists etc. How Soon automatically gets departures based on your location and shows you information that is relevant to your location. It is built specifically for public transport in Switzerland. Departures from nearby stations based on your location (Supports GPS and network location). Uses real time schedules to give you the most accurate departure times. Allows switcing among near by stations. You can get app on Play Store. This idea came into mind as we needed an app which can quickly show us next departing metro/bus from nearby stops. Although, SBB mobile app does pretty good job but you need to manually search the source and destination stations before you can get the departures. HowSoon saves a lot of time by fetching all the departures from nearby stations.